Application: The thumb should be held in a neutral position. 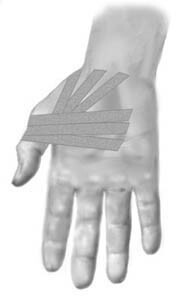 Start in the middle of the palm adjacent to the wrist, draw the tape around the thumb’s metacarpophalangeal joint and return to the palm and cross the start tape (A). The next tape is applied in similar fashion, but started slightly further out on the palm (B). A third strip can be applied in a continued fan formation. (C).